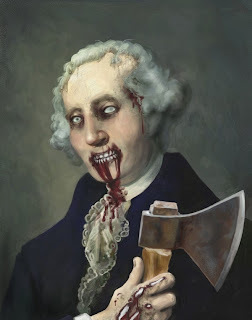 The election season is well underway, making it a perfect time to take a look at some of the ghost stories about Founding Fathers, such as Thomas Jefferson and George Washington, that have been reported over the years. Famous Ghosts: True Encounters with the World Beyond. 1. George Washington's Ghost: The South was threatening to secede from the Union and the nation was in an uproar. But no one was more upset than America¹s first president, George Washington. 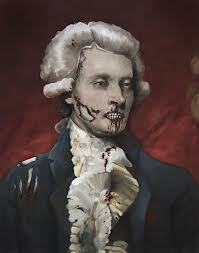 One night, Senator Calhoun of South Carolina woke up to see Washington¹s ghost standing over his bed. The apparition warned him of the impending perils of splitting the Union and threatened that if Calhoun supported secession, ³his signature would be a black spot on the Constitution of the United States.² Calhoun sided with secession anyway, and a dark spot appeared on his hand‹a spot that would not vanish and for which doctors had no adequate explanation. 2. Woodrow Wilson, the Piano-Playing Ghost: The late president Woodrow Wilson is said to still haunt the Woodrow Wilson House in Washington, DC. Guides and tourists have often mentioned seeing his ghostly figure sitting at the piano and hearing eerie piano music. Other visitors claim that Wilson¹s ghost preaches for peace. Once, a viewer heard his spirit say, ³God rest the soul of man; it will win. Man¹s soul will be free to know its own importance.² Is the restless spirit of the ³Peace President² warning us to maintain peace? Or is he simply looking for an encore? 3. Thomas Jefferson, the Posthumous Ladies¹ Man: Perhaps America¹s famous Founding Father wasn¹t always a model citizen. Holzer spoke to numerous inhabitants of Jefferson¹s old haunts who have reported seeing Jefferson¹s ghost with various women. After carefully describing these visions, historians identified one apparition as the beautiful daughter of W. Skelton, a local gentleman who worked in the area. 4. 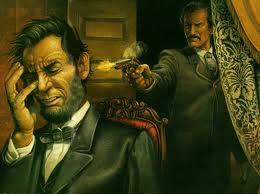 John Wilkes Booth, Unwilling Accomplice: The mystery behind Abraham Lincoln¹s assassination continues, but the spirits might have some answers. The spirit of Edwin Booth, John¹s brother and an actor like his sibling, spoke clearly through a psychic medium one night. The ghost said that John was hired to kill Lincoln by several prominent figures, including double agent John Surratt of the Confederate Army, War Secretary Edwin Stanton, and the unidentified ³Major General Gee.² Bribes were exchanged and guns were supplied. Edwin¹s spirit is still desperately trying to clear his mad brother¹s name. 5. Aaron Burr, Heartbroken Dad: Famous for killing Alexander Hamilton in a duel, Aaron Burr has been persistently misunderstood. Accused of treachery, forced to leave America, shattered by the death of his first wife and daughter, and deceived by his second wife, he wore out a bleak, solitary life. His ghost, not surprisingly, still haunts his old living quarters and stables on West Third Street in New York City¹s Greenwich Village. Always angry or sad, the spirit is often hiding from solders or demanding truthful answers. But more often then not, his paternal instincts take over, and he yells out, searching for his favorite daughter who was lost at sea, his beloved Theodosia. What did you think of these stories? Go buy it now if you're interested in reading more! Check the links above, and remember by clicking on the links your helping out Stuffed Shelves, which I must say is pretty awesome! Thanks!